The last time I put a secret ingredient in sugar cookies, it was pudding mix. This time it’s something different. Pineapple extract! Not a lot – just a few drops or enough to add a tiny bit of flavor to the cookies. I got the idea from a reader in California who thought pineapple extract might be the secret ingredient in Potbelly sugar cookies. To date, neither of us has cracked the Potbelly recipe, but I think we’re both enjoying our new extract. Mine happens to be Watkins Imitation Pineapple , which I found on Amazon. As for the base sugar cookie recipe, it came right off the Imperial Sugar bag. The first ingredient is Butter Flavor Crisco, which caught my eye because I recently had some bakery cookies which I was positive were made with butter flavored shortening, but which I liked in spite of that. The texture is irresistibly crispy and light. In fact, I need to go hide the rest of the cookies from myself so that Fuzz can have one for a snack. Preheat oven to 350°F. Line a baking sheet with nonstick foil or parchment paper. With an electric mixer, beat the Crisco and the sugar until creamy. Beat in the water and the 2 tablespoons of lightly beaten egg. Beat in the vanilla and the pineapple extract. Scrape sides of bowl. Add the salt, baking soda and cream of tartar and stir until blended. Add the flour and stir just until blended. Shape the dough into balls about 1 inch in diameter and arrange on the baking sheet. Press down with bottom of a spice jar or shot glass. Sprinkle with sugar. Interesting. Gotta love a wacky secret ingredient. 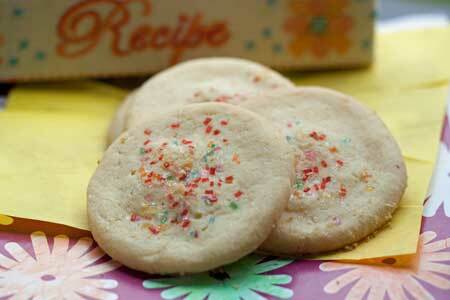 My current favorite recipe is the confetti cookie recipe from Momofuku Milk Bar. I’ve made them twice already (which is a lot of someone who rarely makes anything twice) and I think I’m in love. YUM! I wish I could get my hands on some pineapple extract! I’ll have to keep my eyes peeled! These cookies sound DE.LISH!!! U can buy natural pineapple flavor from the kimg arthur flour website. Adam, Walmart now carries most (or a lot) of the Watkins extracts, pure and imitation. Anna–eh, you just want to try a different brand of extract so you can make the cookies again. 😉 jk Would have never thought of pineapple extract, hmmm. Karen, the dough is easy to work with. I chilled it for a day and while I didn’t try it as cut-outs, I think it would be pretty easy to break off sections and roll it out. But I like the rounds! The Watkins pineapple extract is pretty strong and a little bit goes a long way. I may buy a different brand just for comparison. I love that you don’t have to roll out the sugar cookies. For some reason, rolling and cut out cookies and I do NOT get along. Ha. I should get the GOOD quality pineapple extract. I have a very cheap brand and can not tell that I am using it. Phooey. I’m glad those cookies are not at my house or they would be gone..sugar cookies are some of my favorites! Love the “secret” ingredient! That is an interesting secret ingredient. The cookies sound as if they’re irresistable! Hope Fuzz likes them too! Interesting secret ingredient. I am sure they are delicious like all your cookies are. Very interesting! Just might have to order pineapple extract from Amazon – or wonder if they have it at Sur la Table! I’m all about Crisco in cookies now, the texture it gives is terrific. I’m interested to try a sugar cookie with it, especially since the texture your describing reminds me of the other “Secret Ingredient” recipe. AKA: Best Ever :). And curse you and your fancy extracts :).